When I was losing my motivation and feeling frustrated with my own situation, someone told me that even a slow snail will make it to its destination eventually. Sometimes in life, whatever you plan doesn’t happen the way you planned it; what you wish to achieve doesn’t come as quickly as you want it to…but that’s okay! My April 2018 Bullet Journal Setup is a reminder to myself that I need to slow down and take one step at a time. If I put all of my efforts into doing the right things, what I want will eventually happen. 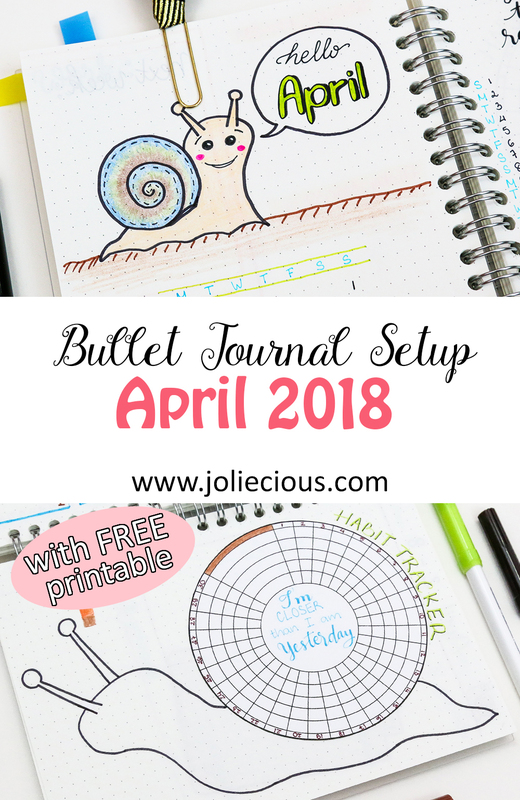 The theme I chose for April 2018 Bullet Journal Setup is snail: slow but steady. If you’re feeling the same and need a little pick-me-up, I hope you find this bullet journal setup motivational. Make sure to scroll down all the way to the bottom, because I’m sharing with you a free habit tracker printable. For the cover page of April, I decided to keep it cute and simple with a lovely snail saying “hello April”. I missed having a quick-glance calendar for March so I’m bringing it back for April 2018 Bullet Journal Setup. My snail drawing isn’t the best but I think she is pretty adorable! The next page in my April 2018 Bullet Journal Setup is dedicated to my goals for April. I have all of my goals into two categories: Personal goals and Blog goals. Beneath that, I set up a Weekly Actions section where I list what I will need to do each week in order to reach my monthly goals. We finally come to the page that I’m most excited to share with you this month: my April habit tracker! While setting up the habit tracker page, I tried to come up with something that’d match my snail theme. I’m very proud of myself for coming up with this habit tracker and super duper happy with the result. And guess what? I’m sharing this 30-day snail habit tracker with you. Simply click the image below and download the free printable. It’s made to fit any A5 sized notebook, but you can adjust the size when printing. The last two pages are the weekly spread for the first week of April. I’ve been using this layout very frequently and still love it. To keep my theme consistently, I added a little snail as the weekly spread header. With the empty space, I glued a piece of scrapbook card where I will be filling in little happy things that happen throughout the week. What is your theme for this month? Comment below and let me know. If you decided to use my snail habit tracker in your bullet journal, please tag me on Instagram @joliecious because I’d love to see all of your recreations.